As usual, Br. Dominic gave an excellent homily today at Mass. He started by saying that we all get Christmas. Birth, we understand. But none of us know what the resurrection was like. We know there was an empty tomb, and we know of the presence of the Risen Lord. But we have no account for the resurrection as a moment in time. But the miraculous thing is that we see the evidence of it all around. The fruits of the resurrection are everywhere. And Jesus is of course the first fruit of the resurrection. We who receive him in the Eucharist take part in the resurrection. All the martyrs of the Church over the years knew this well, for they were people who believed in the resurrection so much, because they knew the that they elected to die rather than say otherwise. Irish poet Joseph Plunkett is one such martyr. He was imprisoned by the English army in the early 1900s, and was executed in 1916 when he was only 28 years old. 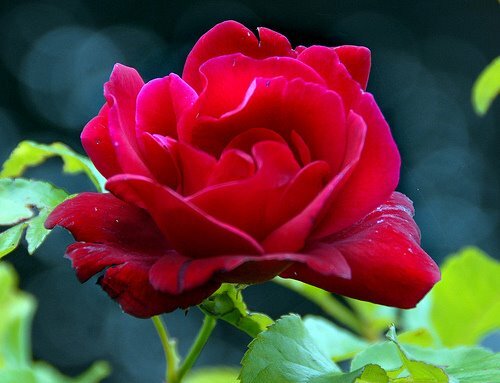 “I see his blood upon the rose”: When we gaze at a rose or any other part of this universe, we see not only the individual beauty of the rose, precious and awesome in its own right. We see also the intensity of the God’s care behind that rose and behind the universe itself—an intensity revealed in Christ’s all-out, self-giving love, in his blood spilt for us on the cross. “And in the stars the glory of his eyes”: In the stars we see not only the glory of his death and total self-giving. We see also the glory of his risen body and his death-conquering gaze. “His body gleams amid eternal snows”: When we look at snowcapped mountains or other snowy vistas, we might see glimpses of Christ’s pale body, as when taken down from the cross—or his glorified, transfigured body shining brighter than snow. “His tears fall from skies”: Again, behind the lovely everyday processes of nature such as a spring shower, we can’t help seeing the love of our Great Lover—and the tears he shed over Jerusalem or during the pain of his agony in the garden. The beauty of rain is admirable in itself, but when we link it with the outpouring love of our gracious God we grasp an added depth and beauty. “I see his face in every flower”: Every flower, indeed everything in this universe, reminds us of Christ. As St. Paul tells the Colossians (1:16), “All things were created through him and for him.” We recall, too, that St. Francis saw in the beauty of flowers the One who is Beauty itself. “And carven by his power/Rocks are his written words”: Christ, the Word made flesh, is truly intermingled with the universe. Creation itself is a reflection of the Word through whom “all things came to be” (Jn 1:3). “All pathways by his feet are worn”: At the Incarnation, God made this world his home. Every path, trail and road of this earth has taken on an elevated dignity and meaning because of the pathways Christ took while accomplishing his mission on earth. All paths remind us of the pathway he took to save us—the Way of the Cross. “His strong heart stirs the ever-beating sea”: In the sea pounding against the jagged coast, we get glimpses of Christ’s mighty heart pounding with love for us. “His crown of thorns is twined with every thorn”: Every thorn is somehow intertwined with Christ’s crown of thorns. Indeed, in every created thing we see Christ’s saving love. “His cross is every tree”: Behind every tree, we can see Christ’s cross—and the Creator’s unconditional love. This entry was posted in Poetry, Reflections. Bookmark the permalink. i know I read this poem once when you showed it too me on your cell phone, but I still have to say it is really beautiful.